Bob and I had been catching glimpses of the Western Scrub Jay (Aphelocoma californica) since our arrival at Grand Canyon National Park, but it wasn’t until we were on our early morning hike down the Bright Angel Trail that we finally caught sight of a Western Scrub Jay sitting in a tree…stationary enough for us to snap a few quick photos before we continued on our marathon hike. 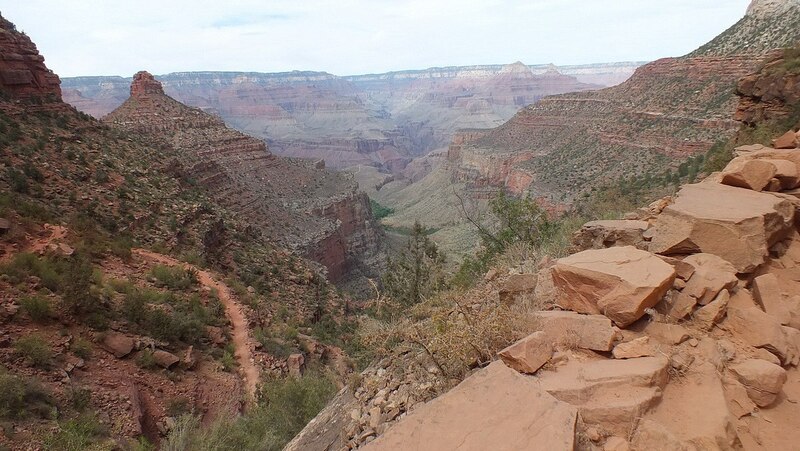 It was on our 4th day at the Grand Canyon that we undertook the grueling 12-mile hike from the rim, down to Indian Garden and Plateau Point. 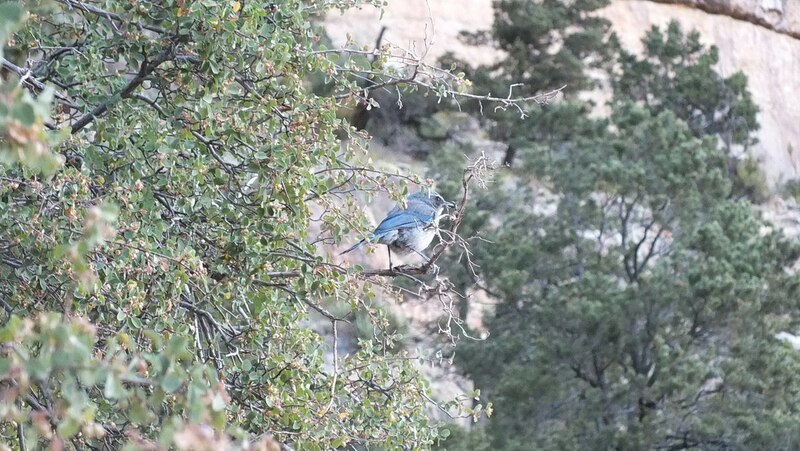 We started very early in the morning…5 a.m.
Bob and I were barely underway, just a few hundred metres below the South Rim, when we saw the telltale flash of blue as a Scrub Jay came in for a landing. 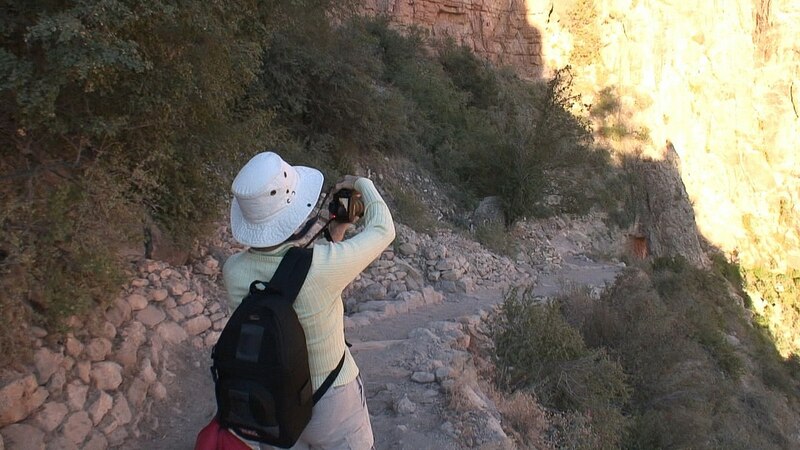 Bob and I were privileged to see the sunrise over the eastern reaches of the Grand Canyon, and were lucky that the Bright Angel Trail was shaded for the initial part of our hike. Associated with the early hour and cooler temperatures was much bird activity, which had us progressing slowly so as not to miss seeing some new species. The Western Scrub Jay is a separate species from our Blue Jays here in Canada, and they lack the distinct crest of our northern birds. 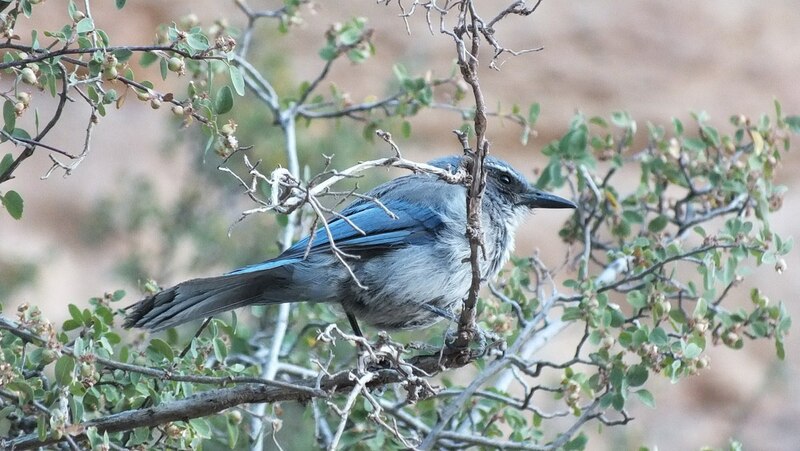 The plumage of the Western Scrub Jays is predominantly a deep azure blue combined with a dusty grey-brown back and greyish underparts. Accenting this is a bluish necklace against a white throat. Of note is their very long tail. 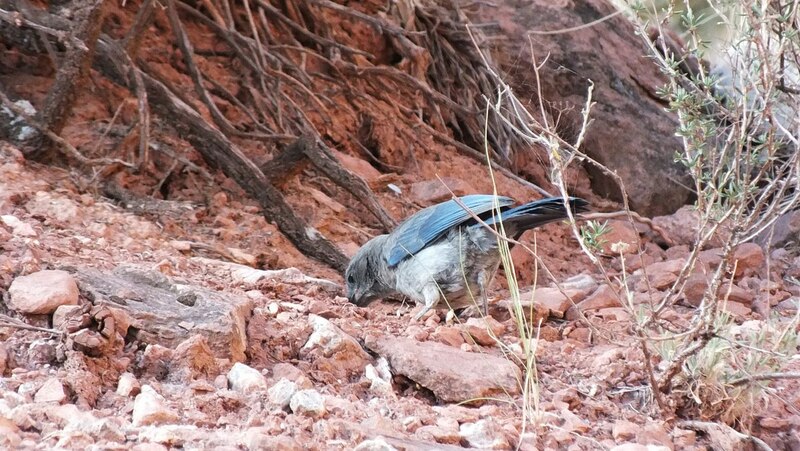 As far into the canyon as Three-Mile Resthouse, we could hear the harsh calls of the Scrub Jays as they darted from one bush to another, but there, at the second rest stop along the trail, several of the jays were foraging amongst the pebbles on the ground. 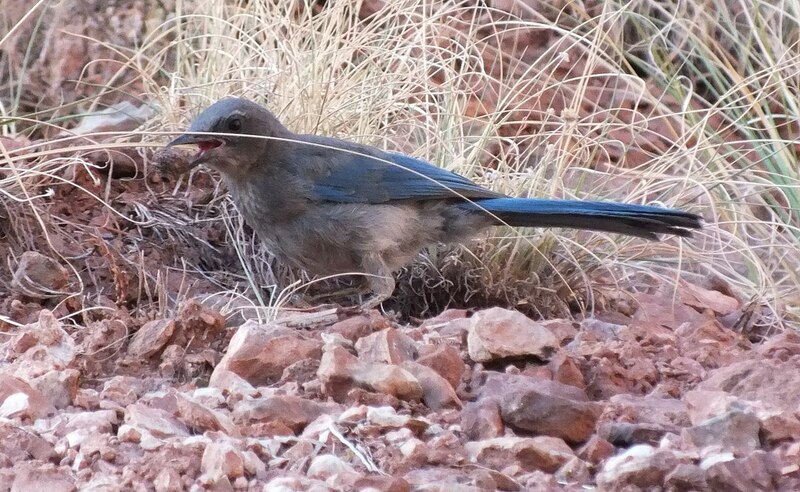 The Scrub Jays were very actively selecting, what appeared to be, one pebble over another, for what purpose, we had no idea since they usually eat insects and fruit during the summer months. 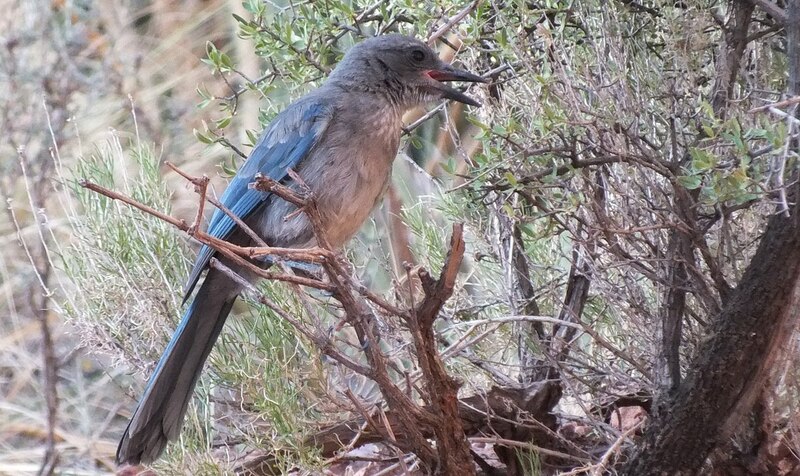 Perhaps the delectable tidbit in this jay’s beak was a juniper berry or acorn since these two fruits make up a substantial part of the Scrub Jays’ diet. In our video, you get to see the jay holding the morsel, and also squawking. 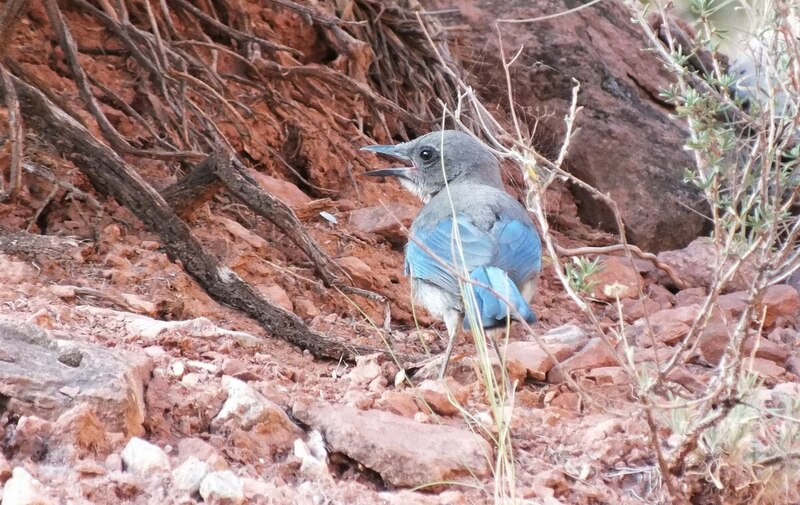 Western Scrub Jays are considered to be among the most intelligent of animals – right up there with chimpanzees. They plan ahead for the future, storing food stuffs in up to 200 caches for later use, as well as keeping track of the type of food stored and its rate of decay. They are one smart bird! 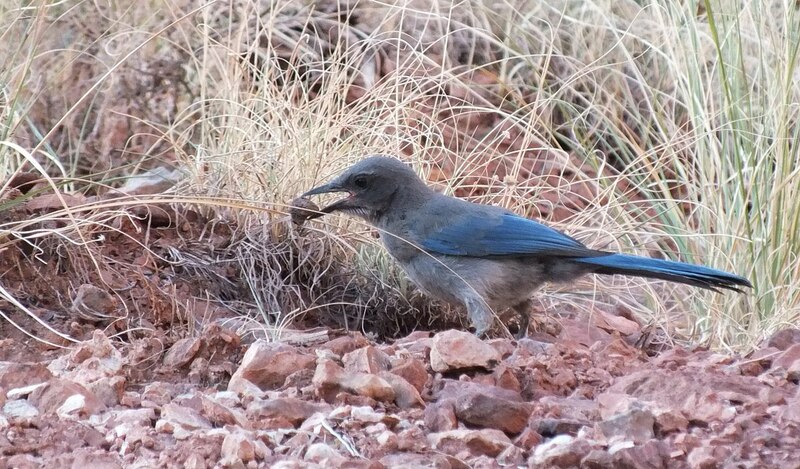 For a good 15 minutes, as Bob and I took a short break at the primitive shelter, we were entertained by the aggressive and mischievous Scrub Jays as they vied for the available bits of food. They seemed quite relaxed despite the constant flow of hikers passing by. Being so clever, I guess they sensed no threat from us. Wow, he looks like a scruffy run away version of our glamorous looking jays, long lost brothers perhaps! 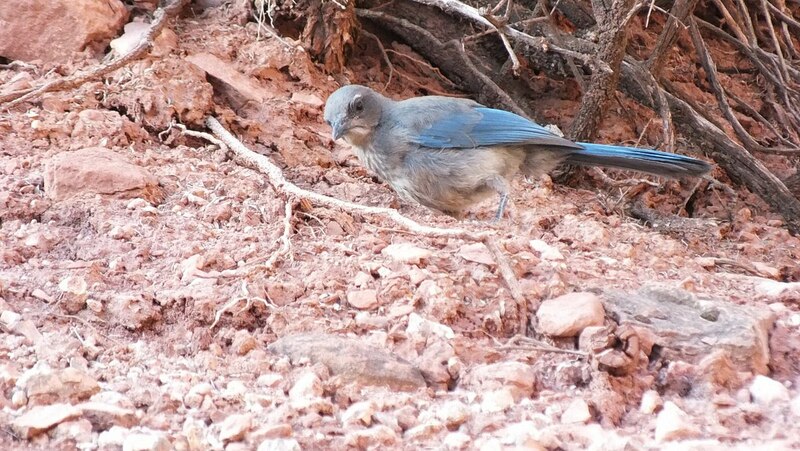 There is an Island Scrub Jay endemic to Santa Cruz Island in the Channel Islands off the coast of California. The San Diego Zoo has been working on protecting and enhancing its island habitat.